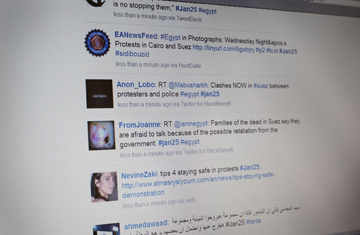 Is Google's Twitter Phone Service in Egypt Doomed? When the Egyptian government blocked the Internet last week in response to demonstrators' use of social media like Twitter and Facebook to organize mass rallies, it not only cut off communication among ordinary Egyptians but also muted their dialogue with the rest of the world. For John Scott-Railton, a graduate student at the University of California, Los Angeles, that silence was a personal blow. He had been visiting Egypt since 2006 to see a close friend, and as the country accelerated toward revolt, he was following the news on the Internet. Suddenly his connection was gone. So Scott-Railton decided that if Egyptians couldn't communicate with the world, he would do it for them, and set out to replicate the cacophony of voices he had been so drawn to. Reaching out to friends in Egypt by telephone, he started gathering updates from different neighborhoods and posting them online at his Twitter account @Jan25voices, named for the day the protests began. When he heard that Egypt's mobile-phone networks were likely to be shut down, he drew up a list of people he knew with landlines. Over the roughly 24 hours on Jan. 28 when cellular communications were turned off, many journalists struggled to file their stories on the protests. But anyone following @Jan25voices knew what was going on. "Some of the updates I was getting were from people's aunts standing at the window, holding their phone out so I could hear what was happening," he says. In an earlier age, Scott-Railton would have had no choice but to wait, perhaps as he searched the dial for mentions of the events in Egypt. Today the 27-year-old Michigan native is in the middle of the information flow, one of a host of bloggers and tweeters who are in many cases doing as much as professional journalists to deliver news the Egyptian government is struggling to contain. Scott-Railton's Twitter account lists him as having just over 4,000 followers, but that considerably understates his influence, since his tweets  which he posts at a rate of about 50 a day  are visible to all those who search for information on the protests. Blake Hounshell, managing editor of Foreign Policy magazine, subscribes to his posts, as do the editors of several other major news publications. And Scott-Railton says the BBC, NPR, the Los Angeles Times, al-Jazeera and the Wall Street Journal have all reached out to him for analysis or help in finding Egyptians to interview. "In years past, the idea was that you could only understand the situation if you were on the ground," says Sree Sreenivasan, a professor of digital media at Columbia's Graduate School of Journalism in New York City, who has been tracking the developments in Egypt. "What we have learned, though, is that there is a real role for social media for people who are far away from the action to bring context, understanding and analysis." Scott-Railton, who speaks rudimentary Arabic and has mostly used English  and occasionally French  in his reporting, has no training as a journalist. And yet "a lot of the questions of journalistic ethics are now on my mind," he says. "How do you confirm information? How do you avoid echo chambers? How do you substantiate?" When new sources began e-mailing him after his initial postings, he insisted they provide contacts, preferably in the U.S., who could vouch for their identities. He says his goal is to provide the "human component" of the story, "to make it feel as exciting and as relevant as the pictures of tanks rolling around." Once, news organizations spent years, if not decades, building institutional credibility so that their audience felt comfortable trusting them. Scott-Railton has had a week. "I've definitely taken a side," he says. "I'm tweeting the voices of protesters. It's not like I'm tweeting the police. But the tone I'm trying to take is not breathless. I'm trying to be careful  especially because the medium pushes you in the other direction." "Can you hold on a second?" Scott-Railton interrupts our interview to share another scrap of news. "I have people [in the Middle East] watching different news networks and feeding me information," he says. And indeed, not much more than a second later, it's there on his Twitter feed: "Arabeya [sic]: Closure of Egyptian Rail #Egypt #Jan25." In the language of the uninitiated, he's told all those watching Twitter for news on the protests that the Dubai-based news channel al-Arabiya has reported that Egypt's rail lines have been shut down. Since he first set up @Jan25voices, Scott-Railton has expanded his efforts, recruiting partners in Egypt and throughout the Middle East to monitor what the Arab-language news channels are reporting. Sometimes he doesn't just post the information he receives from a phone call but also the call itself. One recording of a young Egyptian talking to him from the protests has been listened to more than 275,000 times. "The idea that I can reach out and take a person's voice and help yield it up to that many people  I'm proud of that," he says. "That's really more interesting to me than my own voice."